Like countless others, as a brand new Christian, a teenager, in 1969 I heard the story of the five missionaries murdered in Ecuador January 8, 1956: Nate Saint, Jim Elliot, Ed McCully, Roger Youderian and Pete Fleming. It helped shaped my view of being sold out to Christ, and has been a reference point all my life. It has also been the single greatest missions recruiting event since the days of the apostles. It has resulted in not just hundreds, but untold thousands of missionaries going out to countries all over the globe. The sacrifices of those dear families have benefited innumerable people groups. After we’ve been in Heaven 5,000 years I expect we’ll still be meeting people who came to Christ because someone became a missionary as a result of this event. I have on my desk in front of me the January 30, 1956 Life magazine that captured the world’s imagination concerning the five martyrs and their widows and children. January will be the 50th anniversary of the killings. I pray that the documentary and the movie will both give this story to a new generation. Even among evangelical churches, every year there are more people who do not know what happened on that jungle beach. This great story is gradually being lost to successive generations, and now is the opportunity for its revival. Through Gates of Splendor was the title of Elizabeth Elliot’s book that told the story long ago. A documentary narrated by her had the same name. An outstanding 40-minute documentary, Beyond the Gates of Splendor, can be watched at home or by churches or groups. It has interviews with a number of the tribespeople who were there, and with all five of the widows. It was filmed just in time since Marylou McCulley (wife of Ed McCully) and Marge Saint (wife of Nate Saint) have gone home with the Lord, and Elisabeth Elliot’s niece (who lives nearby) told me that her “Aunt Betty” is no longer in condition to give an interview. Had the missionaries not come to this tribe, and Rachel Saint, Nate’s sister and Betty Elliot and her little girl, Valerie, not followed up by bravely going to the killers of their loved ones, their entire culture would have died. They were, according to sociologists, the most violent people group in documented history. 60% of their males died as a result of spearing, children were buried alive with their fathers, etc. I saw an advance preview of The End of the Spear. I thought it was great. It deliberately stays low key, as it tries to reach a secular audience and not be a Billy Graham film (which is NOT to say those films haven’t been greatly used of the Lord—they have—only that it’s a different strategy). But there is no doubt why the missionaries are there and why they are taking these risks. Later Mincaye is plagued by the fact that he knows the men could have killed them with their guns, but didn’t. It makes no sense to him, and no outsider knows their language to explain. Finally Mincaye, the Waodani warrior (known to the world as “Aucas,” meaning “naked savages”) meets a woman who grew up in his tribe but now is a Christian, and knows the missionaries. He asks her why the foreigners did not shoot them when they attacked them with the spears. She says something like “because they believe God has a Son, and His Son became one of us, and when He was speared by us, He would not spear back.” At this point I was bawling. Though this was not be a blockbuster like The Lion, the Witch and the Wardrobe, it was a major motion picture release. I think many people will find it very moving and satisfying, and a tremendous bridge to the gospel. (It is also extremely respectful to this people group, breaking what some see as the missions stereotype of white Christians being good and brilliant and natives being evil and stupid). Finally, attached is a photo someone took at CBA, in which I’m with Mincaye (who’s a foot shorter than the actor who plays him in the movie), and the family of two of the missionary martyrs: four sons, one brother and a grandson. Mincaye speared to death both Nate Saint and Ed McCully. But he came to Christ, and for many years now he has been a transformed man. He is a delightful brother who is a joy to be with. Steve Saint calls Mincaye “father” and Jamie Saint and his brother call him “grandfather.” Years after the killings, Mincaye baptized Steve Saint and his sister, and then years later still, he baptized Jamie Saint and his brother. What can account for the reality of grace and forgiveness and transformation, and the closeness of these relationships but the power of God and the gospel of Christ? There is no other explanation. 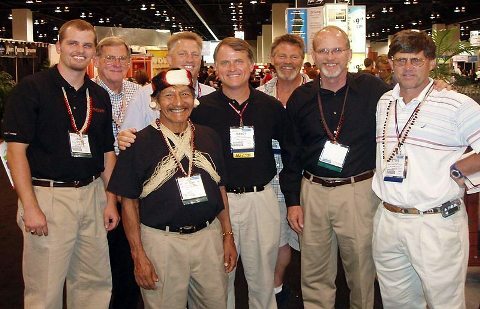 Black shirts, from left: Jamie Saint (grandson of Nate Saint), Mincaye (killer of Nate Saint and Ed McCully, later converted to Christ, now a leader of Auca church), Randy Alcorn, Steve Saint (son of Nate Saint). Others from left: Jay McCully, brother of Ed, and three sons of Ed McCully. Steve McCully is on far right.